The changes to the bylaws are official, and are posted under the "Member Resources" tab on the left side of your screen. Open the tab, scroll down to "Const./Bylaws" and select "MCLEA bylaws - Ratified 03-02-18". If you have any questions or comments regarding these changes, please email any of the MCLEA Officers or Board of Directors. 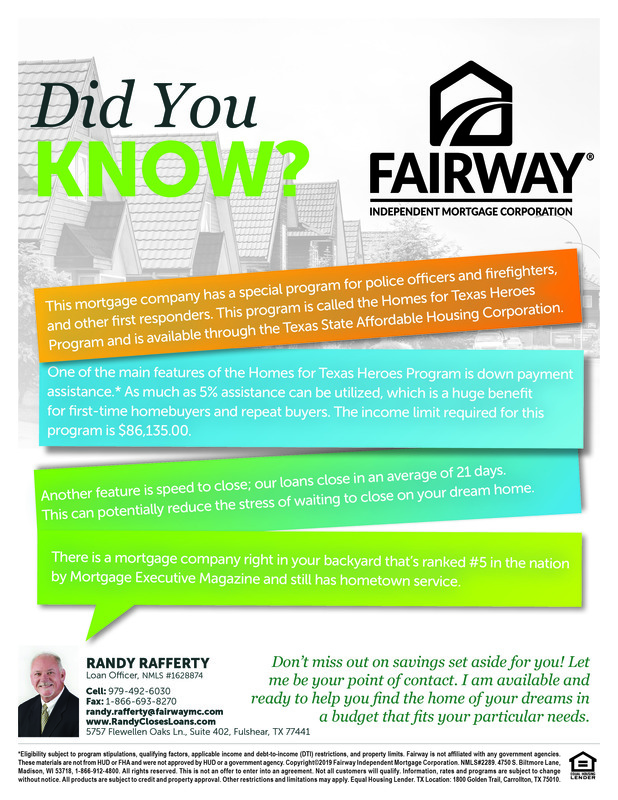 Fairway Mortgage Company is offering the Homes for Texas Heroes Program, which offers a down payment assistance as much as 5%. Please reach out to Lt. Joe Sclider with Pct 1 Constable's Office for tickets. I received the following from Retired Austin PD Officer Randy Malone. Please pass it on to our retired Brothers and Sisters. __________________________________________________________ Dear Association, You may already be aware that CLEAT has started a Retiree Association for retired officers and other classes of retired law enforcement employees. MCLEA members, If you haven't already, please take the time to sign up on this website, and make sure to include a valid email address so you receive our communications. If you are already signed up, please take the time to log in and make sure your current email address is on your profile.